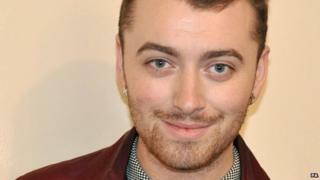 Singer Sam Smith has denied rumours he is singing the theme tune to the new James Bond film Spectre. The Brit and Grammy-award winning star has long been tipped to take on the task following Adele's hit song for 2012 film Skyfall. However he told Capital FM he was "definitely not" doing it. "People seem to think I'm doing it but I have no idea what's going on. I'm being deadly serious. I think I would know by now," he said. "I heard Ellie Goulding was going to do it," he added. But Gladys Knight - who sang the theme to 1989's Licence to Kill - has thrown her support behind Smith, saying he would be her choice to record Spectre's theme song. "Sam has something in his voice - like it's more than just a song," she told the BBC at the Silver Clef awards in London. "It's a spirit that you have when you deliver your music. And to me, Sam Smith has that spirit. "He'd be a good Bond theme [singer]." If Smith were to sing the song, he could break the film franchise's run of bad luck in the UK singles chart - where no Bond theme has ever reached number one. Adele's Skyfall and Duran Duran's 1985 song A View to a Kill are the most successful songs from the series, both reaching number two. Skyfall was kept off the number one position by Rihanna's Diamonds and Swedish House Mafia's Don't You Worry Child; while A View To A Kill was defeated by Paul Hardcastle's 19. Spectre, which sees Daniel Craig reprise his role as the secret agent for a fourth time, also stars Christoph Waltz as villain Franz Oberhauser. It is due for release in UK and US cinemas on 6 November.